It really is a one-stop shop for baking and desserts and I have picked a couple of classics. Try the apple and pear tart and American cheesecake – ideal for after a summer barbecue served with fresh berries. Happy baking! Ciao. Using a dough hook, make the pastry by kneading the butter with the icing sugar, egg, vanilla powder, salt and vanilla seeds in the bowl of a mixer, Add the flour and almonds and work everything swiftly to a smooth consistency. Shape the pastry into a ball, press flat, wrap in cling film and chill for at least 2 hours. Preheat the oven to 190°C/375°F/Gas Mark 5. Roast the almonds on a baking tray on the middle shelf for about 8 minutes. Put them in a frying pan, sprinkle with the icing sugar and let them caramelise evenly over a medium heat, stirring constantly. Leave to cool and set aside. Butter the tart tin and dust with flour. On a lightly floured surface roll the pastry to a 5mm thick circle and use it to line the tin. Trim off any overhanging pastry and prick all over with a fork. Line it with baking parchment and fill with baking beans. Cook on the middle shelf of the oven for about 12 minutes. Remove from the oven, take out the baking beans and parchment and allow the case to cool in the tin. With an electric hand whisk, mix the icing sugar, almonds, butter, eggs, vanilla blancmange, honey, vanilla seeds and salt to a smooth, creamy consistency, trying to incorporate as little air into the mixture as possible. Peel, halve and core the apple and pear and cut into slices, roughly 5mm thick. Put the cream into the pastry case and arrange the apple and pear in alternate slices on top. Bake in the middle of the oven for 25-30 minutes. Take from the oven and leave to cool in the tin. Whip the double cream with the sugar and vanilla seeds. Put the caramelised almonds into a freezer bag and crush with a rolling pin. Carefully release the tart from the tin and decorate with quenelles of Chantilly cream and the crushed almonds. Preheat the oven to 190°C/375°F/Gas Mark 5. Line the base of the tin with baking parchment. To make the base, mix the butter, sugar, salt, vanilla seeds and flour in a bowl and using your fingertips rub into a rough crumble. Spread over the base of the tin and press down well. Bake on the middle shelf of the oven for about 10 minutes until golden brown. Brush with the egg yolk and bake for 5 minutes. Remove from the oven and leave to cool in the tin. Reduce the oven temperature to 150°C/300°F/Gas Mark 2. With a handheld blender, mix the cream cheese, soured cream, sugar, eggs, vanilla seeds, lemon zest and salt in a bowl. Spoon on to the base and bake on the middle shelf of the oven for 30-35 minutes. It should wobble slightly in the centre but will firm up as it cools. Allow to cool in the tin on a wire rack for at least 2 hours. Cover and chill. Soak the gelatin in a bowl of cold water for 10 minutes. Heat the passion fruit puree in a saucepan over a low heat. Squeeze out the gelatin and let it dissolve in the warm puree. Spread the jelly over the chilled cheesecake. Cover and chill for about 2 hours or until ready to serve. Decorate the edge of the cheesecake with chocolate shards or toasted coconut flakes. 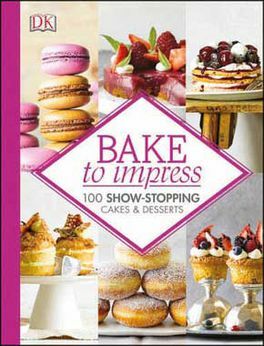 Recipes taken from Bake To Impress by Christian Humbs (£14.99, DK), photographs by Jan C Brettschneider. To order your copy, call the Express Bookshop on 01872 562310, send a cheque or postal order made payable to The Express Bookshop to Express Bookshop, PO Box 200, Falmouth, Cornwall TR11 4WJ, or order online at expressbookshop.com.